A student communication design has used her final year project to raise awareness of dementia. 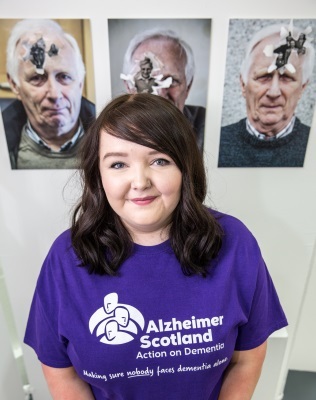 Ashleigh Falconer (21), a communication design student from Portlethen, has used photography to explore how dementia affects a person’s short term memory and has now unveiled her work at the art school’s annual degree show. The former Portlethen Academy pupil explained: “A member of my family currently suffers from Alzheimer’s and although I no longer see her very often, I saw the affect that it was having on my grandparents, who I am very close with and who visit her frequently. Ashleigh worked with her grandfather, who does not have dementia, to create a series of images looking at how the condition affects someone’s short term memory. Ashleigh added: “Before undertaking the project I couldn’t have told you the difference between Alzheimer’s and dementia. I now have a much better understanding of the disease and what it does to a person, and to their loved ones. “One of the most valuable ways in which I researched the topic was by spending time at Forget Me Not in Banchory, which provides invaluable support to those living with and caring for people with dementia. Ashleigh says that she hopes to raise more awareness about dementia through her work, which is on display at Gray’s School of Art from June 18 to 25 as part of the annual Degree Show. She said: “Dementia currently affects around 850,000 people in the UK, and I truly believe that everyone should know more about it. From researching and speaking to people, I became aware of the fact that people don’t usually know much about it until someone that they know is affected by the disease, which can be overwhelming. Ashleigh has also been raising money to support Alzheimer Scotland over the course of her project, with her current total sitting at £280.